No matter where you go, you will see people wearing all different kinds of gold grillz everywhere. While yellow gold is a popular choice amongst fellow gold teeth wearers, another alternative to yellow gold is white gold and silver. People are increasingly wearing white gold and silver to demonstrate a more modern appeal. Silver has always been a popular type of metal for many because of its durability and affordability. Silver has a similar appearance to white gold at only a fraction of the cost. It is much more affordable than white gold, so many people choose this option if they are on a budget. 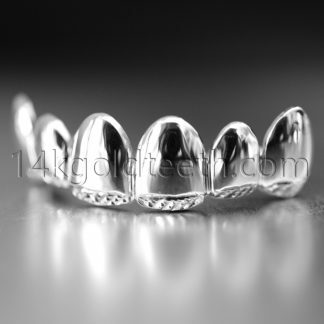 At 14kgoldteeth, we have top grillz in silver with an assortment of customizations. 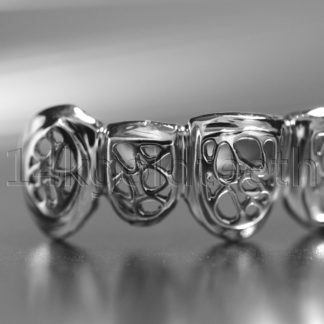 All of our silver is 925 sterling silver with no plating or other harmful metals. Silver is softer than gold and for that reason, it is also very lightweight. 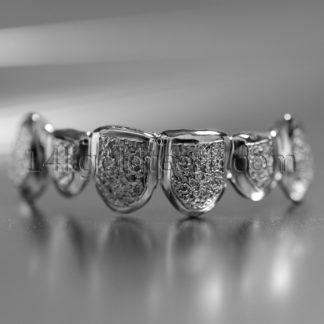 It will not weigh down on your teeth when you are wearing silver grillz. Our silver teeth come in a variety of pieces. We offer a silver single cap, 2pc, 4pc, 6pc, 8pc, and even 10pc. While all of these options may not be shown on our website, we can always create a custom order for the number of pieces that you prefer. 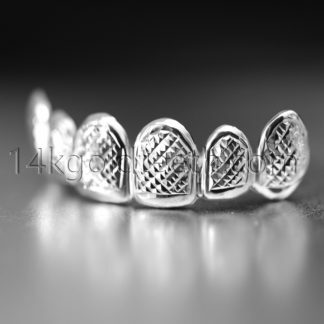 There are also many designs that can be incorporated with the silver teeth. We have our most popular solid design to display a classic look, open face, diamond dust, and iced out. While these are a few of our most popular designs, we offer many more on our website. If the product that you would like is not on our site, we are always more than happy to create a custom order to your satisfaction. 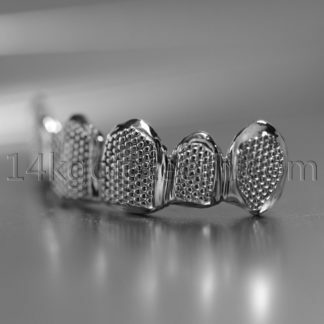 Silver grillz is a great way to accessorize outfits and create a fun appearance. While yellow gold may come off as too flashy for some people, silver is a much more toned down color that can be casual or also dressy. Silver matches with any outfit as nowadays, two-toned metals are very popular. Many people wear two-toned jewelry, such as yellow gold and silver and rose gold and silver. The silver teeth would be a great way to add on to the color coordinated two-toned jewelry. While silver teeth are very popular, it is very important to maintain proper hygiene. We highly recommend cleaning the silver teeth every day to prevent bacteria growth. We also recommend shining the teeth every day so that you can display a bright, flashy smile while wearing your new silver teeth. Will grillz fade or change color? 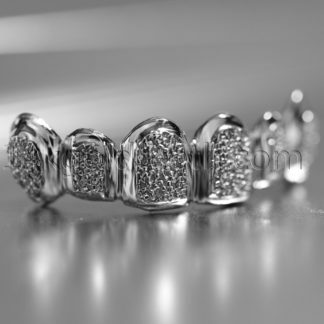 Many people ask us if their grillz will fade or change color over time. The answer to that question is that it all depends on the responsibility of the wearer. In general, the higher the karat of the gold, the longer it will last. However, this factor alone will not prevent your grillz from losing its shine or color over time. It honestly depends on how you care for your grillz. It is important to treat your grillz like it is your own teeth. Similar to how we clean our teeth at least twice a day, you should clean your grillz every day. You can clean it by using a non-grainy toothpaste and a soft bristled toothbrush. After washing, you can use a polishing cloth to shine your grillz or you can use a soft microfiber cloth if you do not have a separate polishing cloth. Another important factor to maintaining the shine and color of your grillz is to not smoke, eat, or drink with your grillz. 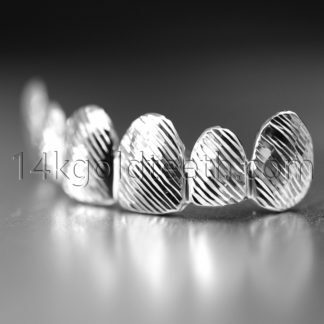 There are many harmful chemicals from drinking and smoking that will affect the longevity of your grillz. It will lead to a faster tarnishing rate and the debris from food can be stuck inside the grill and cause bacteria growth that may damage your gums and health. However, if you do find that your grillz is losing its color or fading, we provide a shine service that you can have for your teeth. 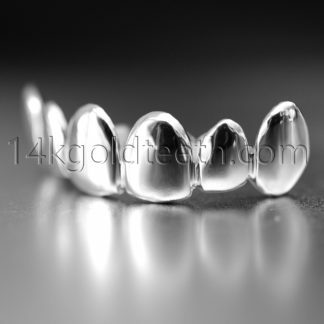 It will make your grillz look brand new and regain its shine. As long as people keep in mind these important tips, their grillz will last a long time. Yes, you can! 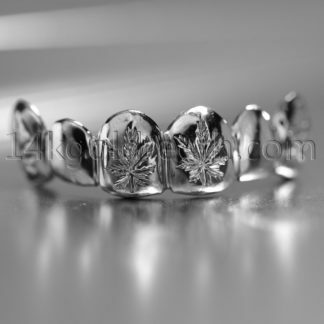 Our company is a custom gold teeth company which means that you can have any design to your liking for your grillz. While the solid design in the most popular because of its simple and classic nature, many people opt to choose a design because it becomes more personal and has a meaning. At our company, we have many designs to choose from. We have diamond cut designs because it shines brightly without having real diamonds encrusted in it. We also have diamond dust designs because it looks like crushed diamonds that have a beautiful shine to it at every angle. 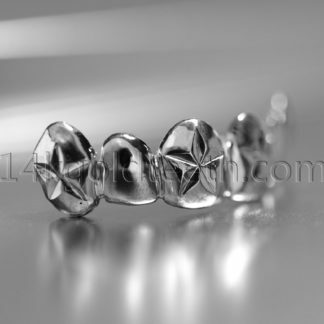 Some of our designs have an open cut to it, such as our open face design that outlines your teeth in a simple manner. We also have iced out designs that look like real diamonds that provide a glamorous shine with all the bedazzled crystals. 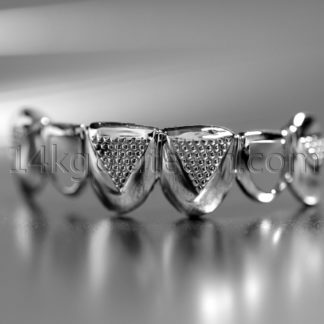 Lastly, we can create custom designs upon request to make your grillz that much more personal.